Born in Brantford, Ont., in 1834, Shuttleworth has been called the “Father of Canadian Baseball.” His contributions to baseball in Canada have come to light in recent years thanks to research by noted Canadian historian Bill Humber. When Shuttleworth was living in Hamilton, Ont., in 1854, he organized Canada’s first formal baseball team, which was called the Young Canadians of Hamilton. From 1854 through the 1870s, Shuttleworth was a driving force behind the sport in Canada and he served as vice-president of the first Canadian baseball organization in 1864. As founder of the Young Canadians, he transitioned the team from the old Canadian rules – 11 players on each team, two-inning games – to the New York rules (which are essentially the rules of today’s game) in 1860. But Shuttleworth was not just an organizer, he was also a catcher and leadoff hitter who participated in the second-ever international baseball game in 1860 which took place a few weeks after the first game that featured a rival Hamilton team. While he was still active as a player, he doubled as the president of the Young Canadians (the team changed its name to Maple Leafs in 1862) from 1860 to 1871. 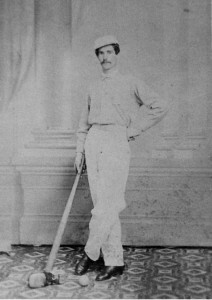 Shuttleworth was also a member of the Ontario team (Hamilton and Guelph players) that finished third in a major Detroit baseball tournament in 1867. Shuttleworth also umpired important games throughout the 1860s, including a Guelph-Woodstock championship match in 1868. Shuttleworth eventually moved to Geneva, N.Y. in 1893 to live with his son. He passed away on March 31, 1903 and is buried in Hamilton, Ont. He was inducted into Canada’s Sports Hall of Fame in 2015.